Promobot – the very first robot on the market with its own unique character straight out of the box. It is designed to work in areas of a high concentration of people and can help people with navigation, answer questions, and remember everyone that it has met . Promobot always attracts a large crowd, and can work independently at a trade show. He is able to talk about anything at all and can be programmed with information about your product or service if required. – Reduce the negative effects of the "human factor". Promobot is unique technology that can collect feedback from clients in the most accurate and honest way. In order to obtain any required information, you can simply ask the Robot a question which is pre-programmed with the answers that you want your customers to hear. Promobot, with his unique charm and appearance can win over any customer and help increase your sales. Promobot can become one of your employees and help you to stand out and distinguish you from your competitors. Companies that use state of the art technology attract more customers. Promobot has the unique ability to "learn" a vast amount of information about the product or service that you want to offer and relay that information in a far more interesting way to your target market. 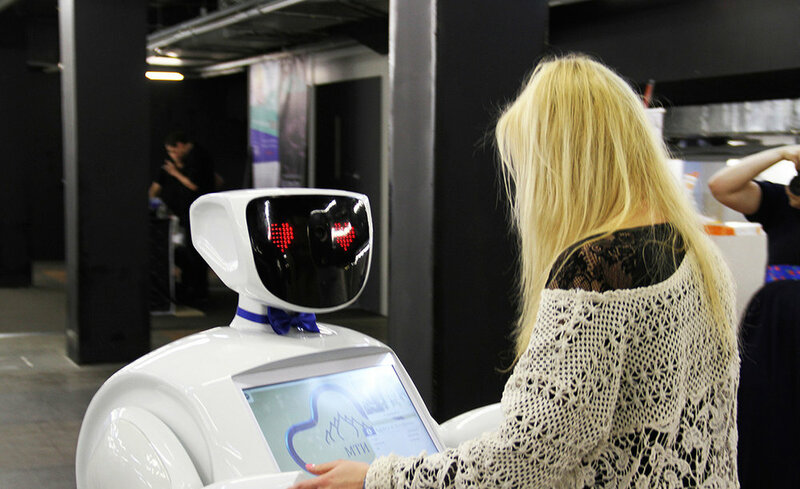 Promobot is used at shopping centres, museums, trade shows, care homes and product launches amongst many other facilities to promote and provide information. 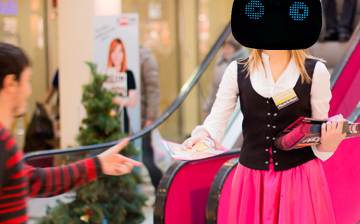 We purchased Promobot to work at the mall. We named it Ginger.....Ginger greets guests at the entrance and offers help. It can answer many questions and helps with the navigation at the mall. But of course, its main function is entertainment of our guests....Since our goal was to increase the value of this place for our visitors, to increase traffic by viral marketing – yes, the goal was achieved. Promobot can also work as an administrator. 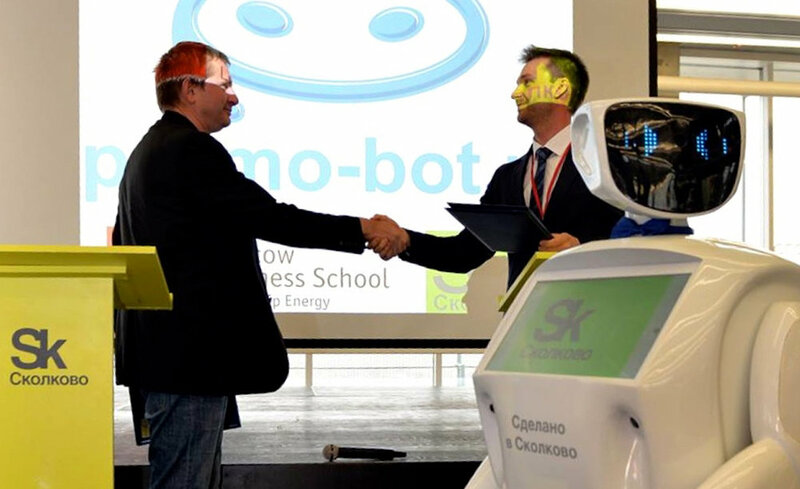 The robot is used with the aim of improving the quality of public services and works as an administrator in a Government building where many visitors now come to him with their questions. One of the most interesting applications of Promobot is as a museum guide. A Digital interactive tour guide can attract people to the museum and provide a huge wealth of information about all of the exhibits as well as using its interactive display to demonstrate the photos and videos that a regular guide is not able to show. Promobot loves interacting with people and helping them, without demanding anything in return, so what better function than a robot concierge? Thanks to its facial recognition and speech it can greet, address people by name, ask them about their day, as well as tell them the latest news. It is aware of everything that happens; ask the robot for an anecdote, a poem, to show you a video, sing a song, or anything else, it will perform it with great pleasure. Promobot can give directions, restaurant opening hours. Ask the robot to remind you of what needs to be done on a certain day, Promobot will never forget. If you want to go outside, but not sure about the weather, ask the robot. The robot concierge recognises people by appearance, and, more importantly, remembers all the residents and guests of the hotel. It will respond if there is a debt to pay at the request of the residents. It is possible to use the robot to call room service or a maintenance person (plumber, electrician, etc.). It will start a lively dialogue. The robot concierge will inform guests if they have missed a visitor. The robot concierge will tell the guests what floor they have to go to, where hotel facilities are located and what facilities are available. It can read a poem, sing a song, show videos and much much more. Promobot is a very hardworking and responsible robot. It works without breaks, lunch and doesn't require holidays or sick leave. It is a quick learner and does not forget anything. It operates autonomously without human assistance.